A new assessment of Africa's massive Congo Basin rain forest finds that it is less degraded than environmentalists feared. The findings were announced in Paris, where African and Western officials ended a two-day conference Friday on an international initiative to conserve this rare, tropical forest. 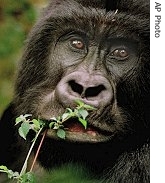 The conservation project is considered the first of its kind for Africa. It is supported by six African countries, with backing from European and American governments and non-governmental organizations. The goal is to preserve the world's second largest forest, which spans six African countries and contains rare and richly diverse animal and plant life. More than 80 million people live in this Congo Basin region, most of them in Cameroon and the Democratic Republic of Congo. Many depend on the forest for their livelihood. Illegal logging, poaching and development have taken a toll on the rain forest. But officials meeting in Paris this week announced that a newly finished profile of the Congo Basin shows it is in better shape than they thought. The two-day conference aimed to assess progress in conserving the tropical forest, four years after the partnership was launched. Among the measures introduced to help sustain the forest is a certification system for timber, so buyers know it has been harvested in an environment-friendly manner. So far, only three percent of the region's wood is certified, but officials say they expect the new system to spread rapidly. France also signed a special debt reduction package with Cameroon this week, which, for the first time, includes forestry and other environmental initiatives as part of the agreement. 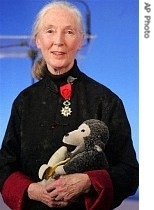 Among those supporting the conservation plan is renowned British environmentalist Jane Goodall, who spoke at a press conference in Paris. "The question was, how do I feel at the end of the conference? Tremendous hope in the fact that these conferences are happening, in the fact that the Congo Basin forest partnership exists, and it is moving ahead," she said. But some environmentalists argue too much of the Congo Basin forest will be open to logging, and that the initiative places too little emphasis on conservation efforts. The critics include Illanga Itoua, African forest campaigner for Greenpeace International. "The basic vision of the Congo Basin they are putting forward does not, and will not, allow them to protect biodiversity and fight poverty," she noted. "Because the activities they have chosen to take place within that landscape are almost exclusively destructive and degrading activities, such as logging, and then with a small place to conservation and very little place for the people of the Congo Basin." Funding is another problem. The United States, France and the European Union have pledged $700 million toward the conservation effort. But African officials say their conservation strategy will cost roughly $1.5 billion to put in place over the next 10 years.